MANDATORY EVACUATIONS: All residents above Alameda Padre Serra (APS) from Eucalyptus Hill Road to Salinas/5 points area to Tunnel Road and above Hwy 192 between Hot Springs Road and Mission Canyon Rd/Tunnel Road. Residents on both sides of Tunnel Road above Montrose. Only residents on the east side of Tunnel Road below Montrose. Residents on Gibraltar Road above the west fork of the Cold Springs Trail should evacuate to the North via Camino Cielo. Residents below the west fork should evacuate South. Evacuation Center is located at San Marcos High School - 4750 Hollister Ave, Goleta. For information regarding the evacuation center, please call 687-1331. An information Call Center has been established for the public to call 681-5197. Tune to AM 1680 for additional information updates locally. Update: 10-14 10:00hrs - 2500+ acres have burned, Over 100 homes have burned, 13 civilian injuries, 5 firefighter injuries, 5400 residents evacuated, No containment. Student and faculty housing units at Westmont College were destroyed. No students were injured. Students sheltered in place overnight in the college gym. Those wishing to extend temporary housing to those displaced by the fire should send their name, phone contact information, e-mail address, house address, and the number of individuals they can accommodate to: westmonthousinghelp@gmail.com. Update: 10-14 09:00hrs - One Los Angeles firefighter injured in roof collapse last night, Preliminary info is that a fire Captain from LA City was injured on the incident. He has second and third degree burns on his face and arms from a roof collapse. Word is that he will be ok. The injured included a firefighter who was taken to the Grossman Burn Center in Sherman Oaks with burns to his hands and face, two others who were taken to UCI Medical Center, two firefighters who suffered smoke inhalation and two residents taken to Santa Barbara Cottage Hospital with substantial burns. Westmont College now Evacuated, Clark building reportedly on Fire as of late last night. Governor Arnold Schwarzenegger today proclaimed a state of emergency in Santa Barbara County as a result of the Tea Fire which has already burned over 2,500 acres, destroyed over 100 homes and required mandatory evacuations and road closures. The proclamation utilizes all resources consistent with the state's authority under the California Disaster Assistance Act. Update: 10-14 08:00hrs - Water Emergency - Due to the firefighting activities in the area, water reservoirs have dropped to critically low levels. We strongly encourage ALL residents in the Montecito and Santa Barbara communities to limit their use of water during this emergency to allow the most efficient use of water for firefighting tactics. Update: 10-14 07:00hrs - 2500 acres, 100 homes destroyed, 13 injuries, Santa Ana winds have diminished across the hills of Santa Barbara and Montecito, The strong Northerly winds will switch to the Northeast this morning. Many Northern Cal Strike teams arriving today, SCU, LNU, TCU, MMU and many local government Strike teams. Fire officials planned an aggressive attack from the air at daybreak Friday with the help of nine water-dropping helicopters and 10 air tankers, Tanker 910 should be over the Fire by 10:00 am if conditions permit. Helicopter pilots had worked through the night, using night vision goggles to drop water on the flames, said Santa Barbara County Sheriff-Coroner Bill Brown. 5,400 residents evacuated from Montecito area. Update: 01:00hrs- Incident Command Post been set up at Manning Park, Aircraft will fly at first light, 70 homes destroyed in Montecito, 20 in Santa Barbara, Rob Lowe, Michael Douglas, and the Oprah own homes in area ...Southern California Edison spokesman Paul Klein said the fire temporarily knocked out power to more than 20,000 homes in Santa Barbara. Update: 24:00hrs - EVACUATIONS - 800 acres 0% contained, West side of the fire is heading into city of Santa Barbara. Westmont College Evacuated Clark building reportedly on Fire, About 1000 Students under evacuation in Gym - all students accounted for, fire-proof shelter of cinderblock - Enough food and water for 2 days. Update: 23:30hrs - EVACUATIONS - 350 acres 0% contained, Evacuations between Mountain Dr. and Hwy 192 between Cold Springs and Sycamore Canyon Rd. Montecito Evacuation Center maybe evacuated. 1,000 Structures Threatened, many structures already lost possibly hundreds. Structures threatened in the area of Cold Springs and Mountain to Hwy 192,(East Valley Rd). -Extreme fire behavior continuing to push fire on to the community. -Continued predicted Red Flag, winds still gusting to 70 mph. Update: 22:30hrs - EVACUATIONS All Montecito residents north of Hwy 192 have been ordered to evacuate, winds are still 50 mph gusts at 71 mph. CHP CAD is reporting it's in Rattlesnake Canyon now, which puts it west of Gibralter Road above Skofield Park. Update: 22:00hrs - EVACUATIONS -Mandatory evacuations in the "Riviera" area of Santa Barbara City this is in the Southeastern edge of the city. - EVACUATIONS -A reverse 911 call has issued for residents living in the Montecito and Santa Barbara foothills. 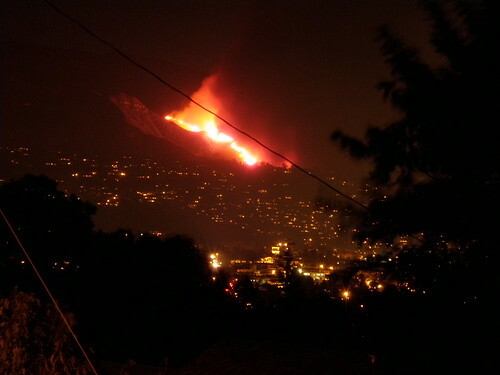 Santa Barbara City Fire Department has ordered evacuations for residents living north of Mountain Dr and Cold Springs. Reports of over one hundred homes lost, Fire is heading in the direction of Santa Barbara. Resource orders: Large resource orders - CAL FIRE Type 1 team order(ICT 10) - 10 Crew Strike teams, 17 type 1 engine Strike teams(Strike Team 1471-Alpha), 10 type 3 Strike teams(KRN,SLU, ) 2 -Type 2 LPF Teams, Vandenberg Hot Shots, Fulton, Rio Bravo IHC, CAL FIRE Type 1 team on order.